As an ancient Reading Cricket Club man, who for countless years has had an affinity with the club that started in 1823, it is only natural that the Author would wish to praise the Cricket Club’s 191 years’ achievements. It was the Club’s President Mr. Archie Sims who will always be remembered as the savour of the Reading Cricket Club. After the Great War he vigorously pursued a “back to normality” campaign and also had the courage to unite the Reading and Caversham cricket clubs. Both Club’s were very short of players following the aftermath of the awful carnage of that War and Mr. Archie Sims brought about what was to become the continuation of the long established Reading Cricket Club. The years 1929 – 1950 are affectionately accepted as the Club’s 21 Golden Year’s. These years were dominated by both Victorian and Edwardian members and only the very best class of people were admitted into an elite Club after being closely vetted for suitability. In 1959 the Reading Cricket Club converged with the Reading Hockey Club. 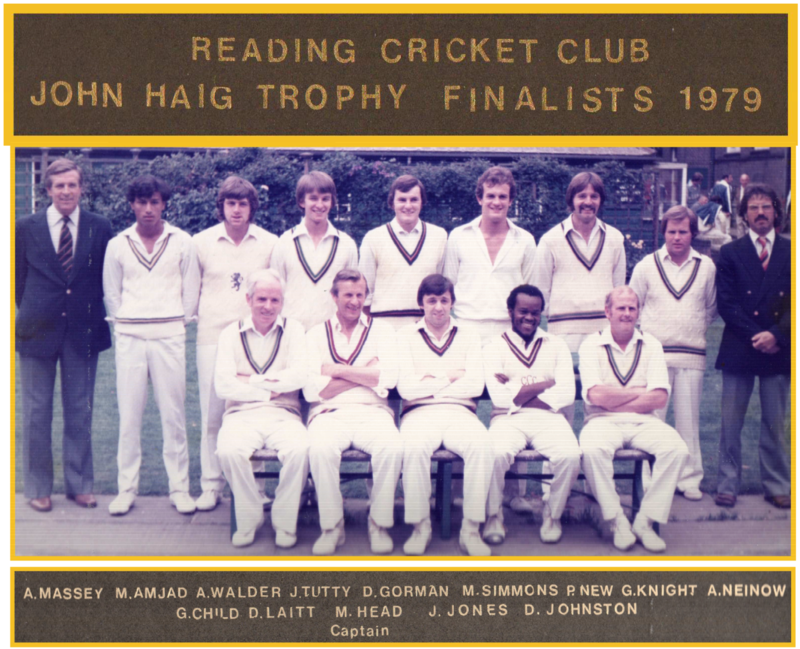 After the convergence and from about 1961 through to about 1986 the Reading Cricket Club was one of the most powerful top ten Amateur Cricket Clubs in the United Kingdom. It culminated with two visits to Lords. First the 1979 Scarborough Cricket Club Haig Cup Final and second the 1985 Old Hill Cricket Club William Younger Cup final. It was in 1986 that the Reading Cricket Club unwisely sold its Church Road freehold Asset and purchased the nine hundred & ninty nine year leasehold Sonning Lane acquisition. was associated with the Reading Cricket Club and he often graced Mr. Stanhope Henry Joel’s star studded sides of the 1920s and 1930s hosted at Church Road, Earley. Below is a photograph of Mr. Joel’s 1937 side showing, amongst many others, Mr. Percy Chapman. 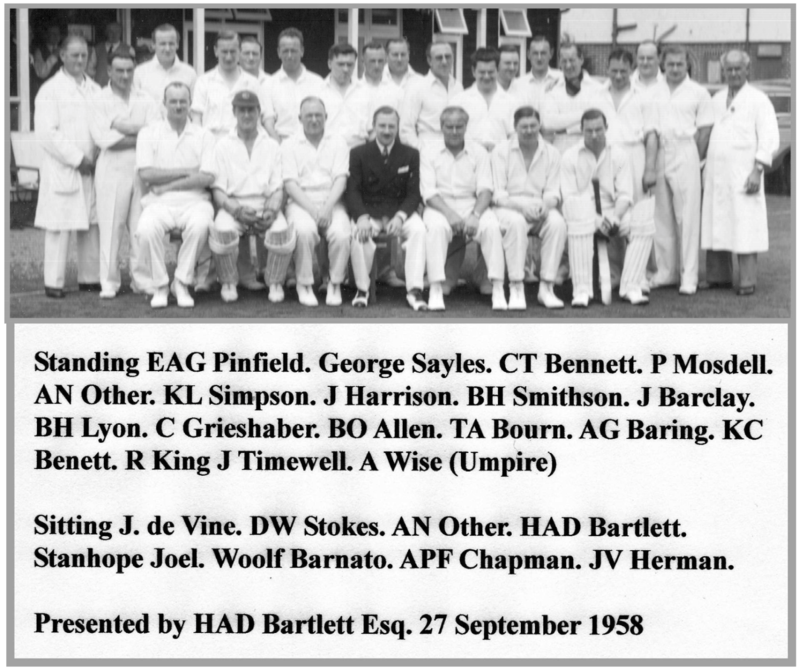 It has been argued over the years that Mr. Percy Chapman took the strongest ever MCC side to Australia. His overall 1925/26 tour success tend to support the argument and for this reason the Reading Cricket Club is proud to have had Mr. Percy Chapman’s connection and also his unstinting support. Whilst acknowledging Mr. Percy Chapman deeds of long ago they ought not to be allowed to overshadow other splendid Colts and Reading players who made the “big time” namely; Tom Dollery, the famous twins Alec and Eric Bedser, Peter May, Ken Barrington, Aftab Habib (all test Match Players). Peter May was also an equally capable England Captain. Neither must we forget Tom Jewell and our classy Wicket keeper Geoff Kirby both of Surrey. And, of course, the little known Tim Hancock of Gloucestershire and Alf Croom of Warickshire. Lastly but not least Michael Mence who played first for Warwickshire and then Gloucestershire. In addition to these splendid players already mentioned there have also been countless other Reading Colts and other young players who have been accepted by the MCC and the Middlesex CC developing academies to improve their various talents. Keven Shine not only played for Middlesex but also is to this day (2014) a highly respected fast bowling Coach. Currently (2014) the Reading Cricket Club manage a first class Colt’s Section operated by a dedicated team of qualified and enthusiastic Coaches who have every expectation that some of their young and talented colt’s will follow in the footsteps of their illustrious Ancestors and extant Forerunners. Moreover, Reading is an ECB Clubmark accredited club and all at the Reading Cricket Club are very proud of its Colts Section. On two occasions The Reading Cricket Club went through all the various qualifying rounds to reach the Lords final. Once in 1979 and again in 1981. Both times Reading were unsuccessful but it has to be said that neither Scarborough or Old Hill could be said to be bona fide Amateur cricket clubs. Yet the higher echelon decided that these semi professional Midlands and Northern League Clubs were eligible to take part in a competition that they structured solely for the traditional Amateur Club’s who’s players paid to play. Group Picture of 1979 Haig Cup. Both these semi professional clubs unashamedly played former Test Match Players (one was still a current Pakistani International and was officially designated by his Club as the Assistant Groundsman) and many others were former County Players who still occasionally played for their counties. 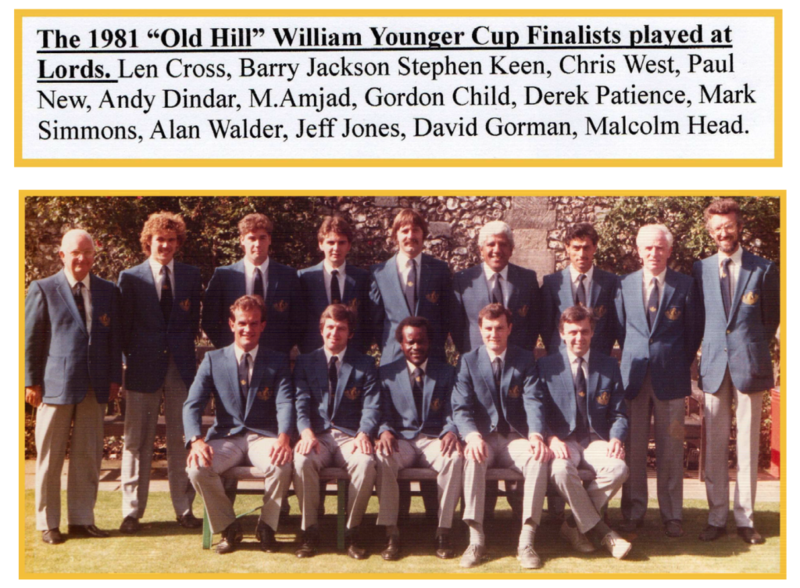 The 1981 William Younger Lords Cup Finalists. You can download the PDF of Allan Gooch's "The History of Reading Cricket Club" by clicking download link below.